I found the first sentence to be illuminating, “Two-thirds of American adults either believe moral truth is relative to circumstances (44%) or have not given it much thought (21%)“. If one-fifth of the population has fallen into such an apathetic state of non-reflection and unconcern in regards to where morality fits within their worldview, not to mention that of their society/culture, it is not surprising that relativism has steadily overtaken an objective moral worldview such as is found in Christianity. 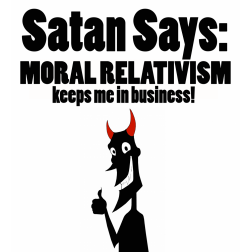 Moral relativism is intuitively implausible. And when we are willing to ask serious questions about morality, we find that we don’t really believe that moral values are relative. Just ask yourself: “Do you right now believe that it’s okay to murder or to be murdered?” You might think: “Well, some people have thought so.” But the question is: “Do you–not other people–right now have any doubt about the wrongness of murder?” This is the place to begin–not what other people have alleged. So we don’t have to waste our time talking about what we both accept as true. We can, instead, begin discussing the real issue–namely, which viewpoint best accounts for the existence of objective moral values. The suppression of truth which Paul refers too, has been alive and thriving throughout the past millenia, ever since the author of relativism, Satan, presented his relativistic ideology to Eve: “did God actually say?” (Gen. 3:1) Paul not only exposes the relativistic ideology, but the reason for it: “For although they knew God, they did not honor him as God or give thanks to him, but they became futile in their thinking, and their foolish hearts were darkened.” When a person, or a society/culture becomes disconnected from God, who is the source of all moral goodness, the alternative of choice in Western countries has proved to be: relativism. Of course, people can be atheists or non-theists (i.e., who do not believe in a personal God) and still share the same moral values as theists (who believe in a personal God). Furthermore, they can develop moral systems which assert the same kinds of values that the theist affirms. This is not surprising since atheists too have been made in the image of a good God–even though they do not acknowledge this. So the issue to face is not, “Do I recognize certain moral values to be objectively true?” Rather, it is, “If I recognize these moral values to be true, which viewpoint offers the best foundation for these moral values? Is it the viewpoint which presupposes an impersonal, non-moral, unguided series of steps in a long naturalistic process? Or is it a viewpoint which presupposes a personal, good Creator and Designer, who has made us to relate personally to him and to live our lives according to the pattern which reflects his moral character (theism)? It seems clear that theism, which is supernaturalistic (there is a reality beyond nature), offers a more plausible picture for affirming these values than does a naturalistic one. So we have seen that moral relativism is rationally indefensible and practically unlivable. Furthermore, if we do affirm objective moral values and intrinsic human dignity, a theistic context helps us make better sense of these moral facts than does an atheistic or non-theistic one. It is our duty as Christians to equip ourselves as Christian case-makers so we are prepared to confront relativism (the decline of objective moral values) via presenting these serious questions in conversations with our friends, family, colleagues,acquaintances. In doing so we will be ‘flipping the switch’ within their unreflective minds and helping to wake them up to the need of seriously considering their stance on objective moral values, as well as a number of other unsubstantiated stances/positions they may be holding to within their worldview. Remember, every worldview has to answer four questions: 1) What are our origins? 2) What is the purpose and meaning of life-why am I here? 3) Morality-how do we decide as to what is right and what is wrong; how do we differentiate between what is good and what is evil? 4) Ultimate destiny-when I die, what is my destination? These are the questions that we, as Christians, need to be asking of those the Lord brings across our path. I invite you to take an insightful and instructive journey on the topic via the following videos. I believe you will be strengthened in your convictions in proclaiming “the Way, the Truth and the Life,” (John 14:6) to those who are awash in the sea of relativism of our age. If you are committed to working on becoming equipped as a Christian case-maker, I highly recommend Greg Koukl’s books, Tactics-A Game Plan for Discussing Your Christian Convictions, and The Story of Reality-How the world began, how it ends, and everything important that happens in between.